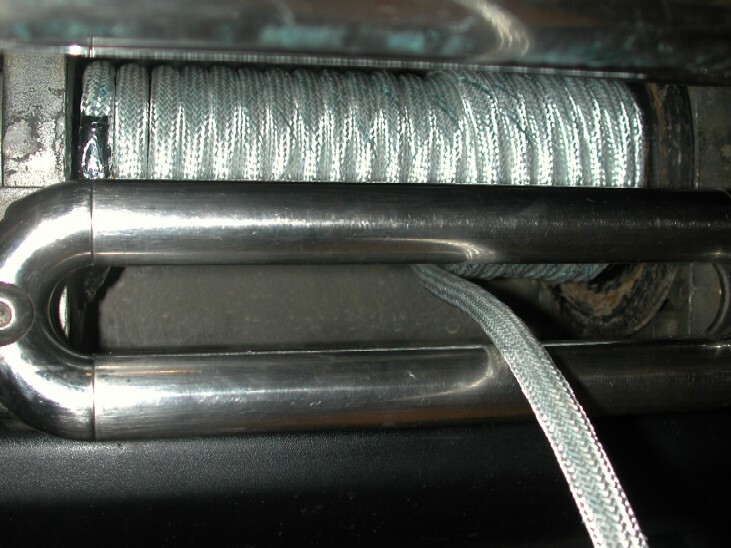 Synthetic winch ropes have now become common place on the Front of today's Land Rovers, for many different reasons. The synthetic ropes are now more affordable than ever before, they are a LOT safer in the event of breakage under load as they store a lot less kinetic energy and will tend to drop to the ground as opposed to "whipping" back towards the winch vehicle if they snap. They float on water, and they are also a lot stronger than steel, my rope is 15 times stronger than a steel rope of equivalent size. 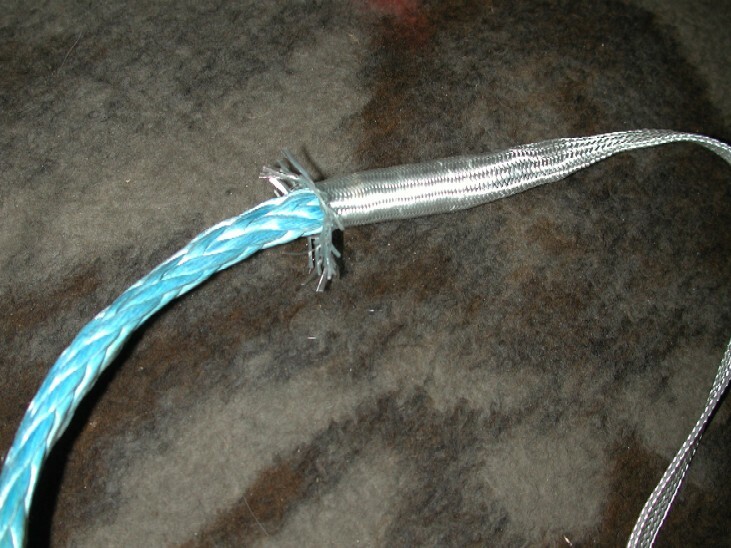 They also offer a big weight saving when compared to traditional wire rope, are a lot safer / easier to handle and in the event of a breakage when "out in the yonder" they can be easily spliced back together again. 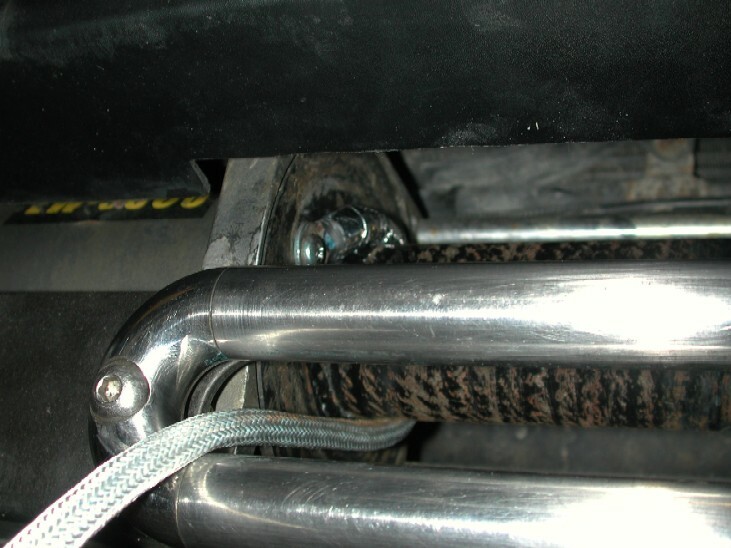 I fitted a Dyneema winch line at the initial install of my T-max winch for all of the above reasons. Synthetic winch ropes do however have some negative sides as well, besides the fact they can be damaged more easily on rocks etc, they are also affected by heat. Traditional winches like my T-max and also many others have the winch brake housed inside the drum, this when in use, produces a significant amount of heat build up, and the more you use your winch the hotter it will get. This issue concerned me a little as the heat generated will affect the properties of the winch rope due to the nature of the synthetic fibres its made from. Different fibres used are affected by different amounts of heat, they all have safe operating temperature ranges, and you will find that winch drum temperatures can exceed these working temp ranges by a significant amount. 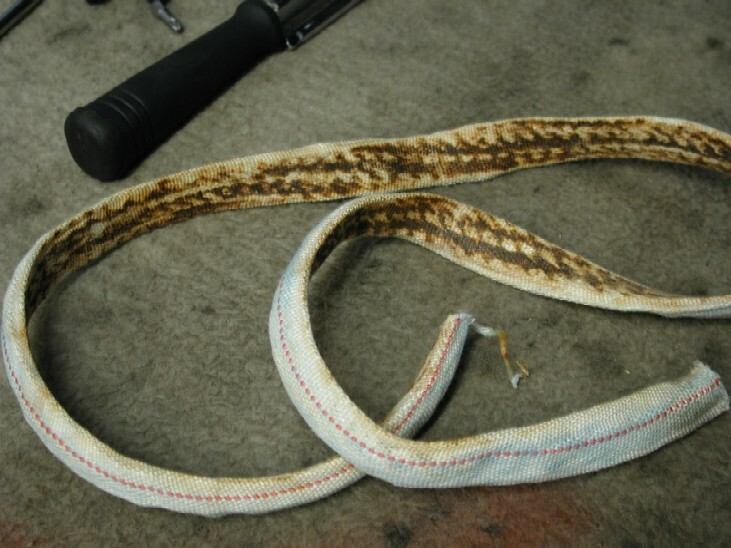 It really all depends on what your synthetic rope is made from as to how much its affected. The ropes "generally" will return to normal properties after the heat has been removed, but not always and we really cant say if and by how much the the strength / integrity of the winch rope has been affected. Dyneema fibers derive their strength from the extreme length of each individual molecule. The fibre can attain a parallel orientation greater than 95% and a level of crystallinity of up to 85%. In contrast, Kevlar derives its strength from strong bonding between relatively short molecules. 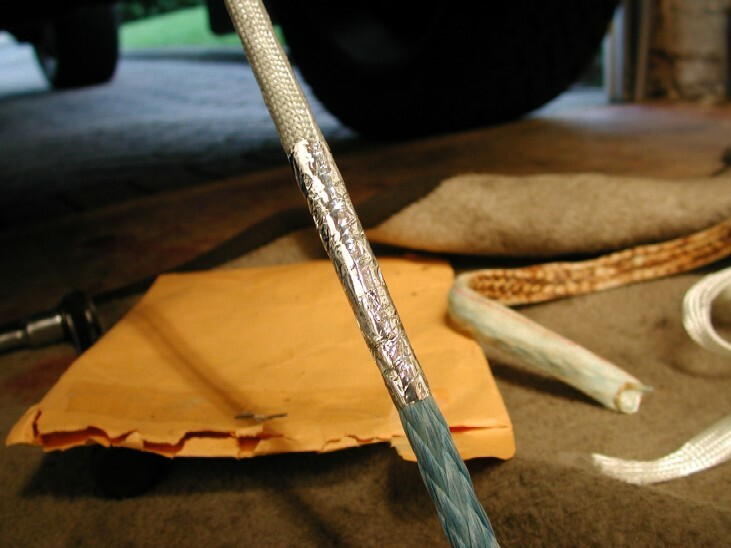 Its melting point is around 144 or 152 degrees Celsius, and according to DSM, it is not advisable to use Dyneema at temperatures exceeding 80 to 100 °C for long periods of time. It becomes brittle at temperatures below –150 °C. This contrasts strongly with other high-performance fibers, which tend to be quite heat-resistant. The fibers feel slippery, similar to polypropylene and other hydrophobic fibers. Most people do not like the way Dyneema feels; for this reason, it is not often used in fabric. The slipperiness also makes such fibers less suitable for use in fibre reinforced plastics. Another problem, in some applications, is that Dyneema will creep, meaning it will deform when placed under any long term stress. Like other olefins, it is very resistant to water, moisture, most chemicals, UV radiation, and micro-organisms. So, as you can see from above, its very strong, resists chemicals and UV light etc but "heat" is definitely it's biggest enemy as it will be with any man made synthetic fibre. So, what can we do ? well as you can see from the picture above, the rope came with a small amount of protective sleeving from new, how ever it was not enough to cover the whole first "wrap" on the drum, I initially installed it with the heat sleeve at the motor end of the drum as this would be where most of the heat would be generated by the winch when in operation, but I was not 100% happy with that and continued to look for something to protect the whole rope at least over its complete first wrap on the winch drum. Here is evidence of the heat that has built up on my winch, and I really have not used it that much in anger yet !! 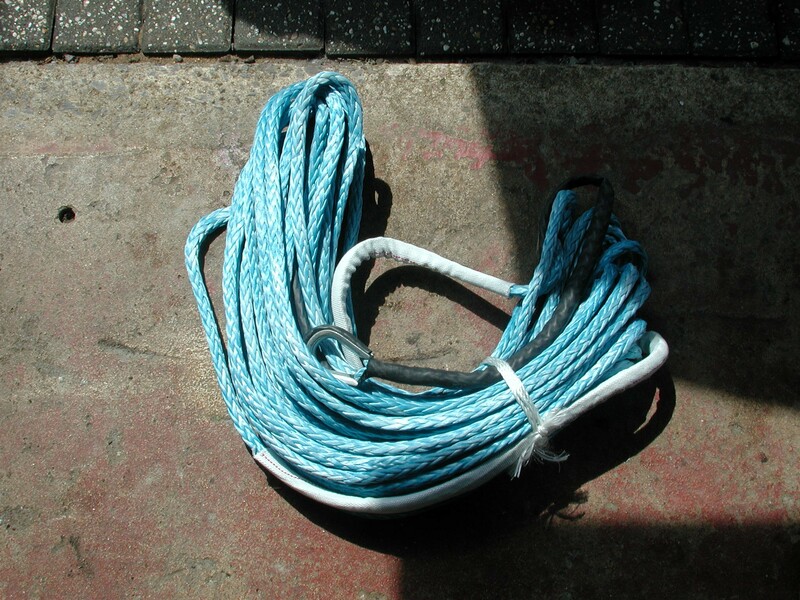 You need to remove you winch rope from your winch to install the sleeving, you start of by feeding it onto your winch rope from the crimp end, its surprising easy to do it as it slips nicely onto the rope and is very flexible, the Dyneema rope fibre really helps as it has a very "slippy" feel to it. Feed as much as you want onto your rope, as I said I recommend at least 20ft, I used 25ft. 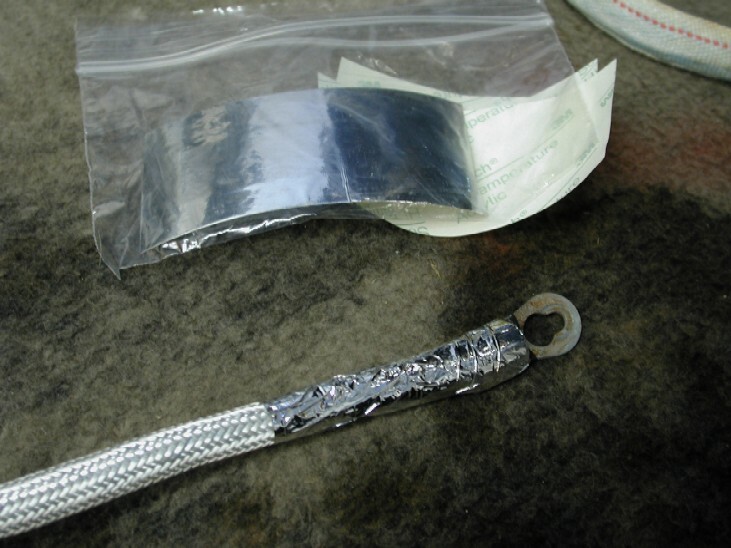 Once you get to the end where the crimp is, you can now secure it using the high temp aluminum tape that comes with it. Now re-fit the winch rope back onto your drum and secure it as per your winch manufacturers instructions. Because of my "discrete" install, it was a little more fiddly to do, but it can be done with the limited access to the winch. If you have a front mounted winch on a winch bumper etc, it will be only a matter of minutes to complete the job. Now power you winch rope back onto the winch drum tightly and as neatly as possible, you will find the sleeve "compresses" as its pulled tighter so it grips the rope very well. 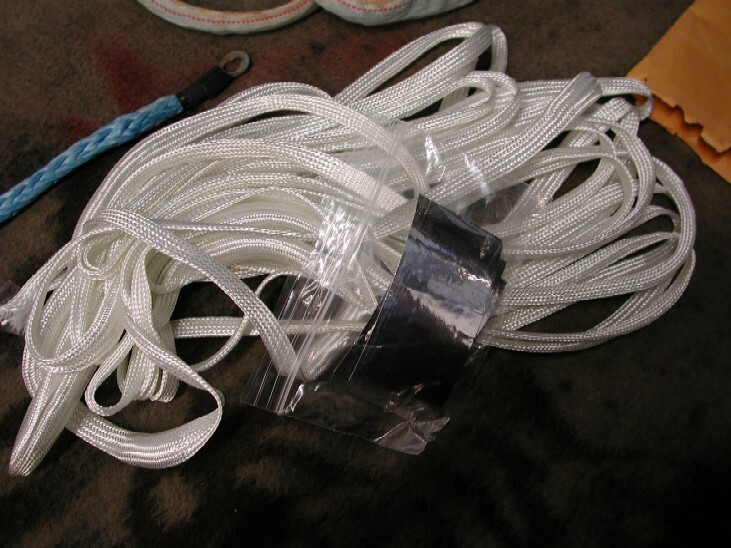 When you get to the end of the sleeving, secure it with some more of the aluminum tape, and then feed the rest of your winch rope back onto the drum as normal. Well, that's about it, I'm now very happy that the heat generated by my winch will not affect the winch rope as its been fully protected !! :o) If you use your winch a lot on regular occasions, then this is the stuff for you!!! The sleeving will soon be available through this website if you would like to purchase some. It will be priced at £1.50 per ft and can be supplied in any length you want. Most winches will require 20 ft min. The sleeve will protect all synthetic winch ropes. A small price to pay to protect that synthetic winch line from heat ! !